Mustad O'Shaugnessy - 3X Short Shank, Extra Strong, Forged, Special Tinned Hook. 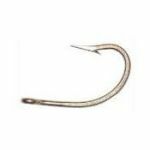 This hook is ideal for trailer hooks on just about any plug or needlefish as well as for tied teasers and rigging eels. In fact it is commonly used as a stronger replacement hook on production plugs.